Because we have been graced with gorgeous, unseasonably warm weather this week, I have made the executive decision to switch out my winter boots for a pair of leopard flats. That's not to say another snowstorm before the end of the 30 for 30 is not a distinct possibility, but I will cross that bridge when I come to it. This outfit is a good example of something I would typically wear on the weekend and not photograph. Just basic, easy and comfortable. Not much to see here. Oh, except an adorable dog. Igby was also excited about the upswing in temperatures, so we spent our Sunday afternoon soaking up the sun. Ooh. I love the red scarf. 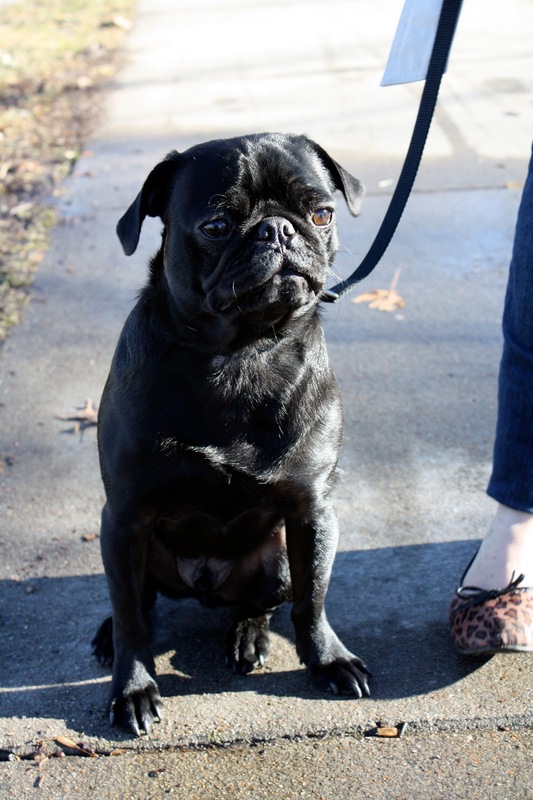 And the pug; I have a black pug too. We weren't really able to get out and about due to snow covering all walkways (but it has been warm here too). i really like your casual style! I really love the shade of that scarf! Provides a good color for the outfit. And your dog is adorable! I love pugs. haha ur dog is hysterical! I like the red and stripes together! It looks Parisian to me for some reason. This is a great casual look. It was lovely here in Wichita too this weekend! I love this. Very chic and quite French. And Igby is so big! I remember when he was a tiny little thing. He's still cute though. The dog got cuter if possible once I saw the name Idby.